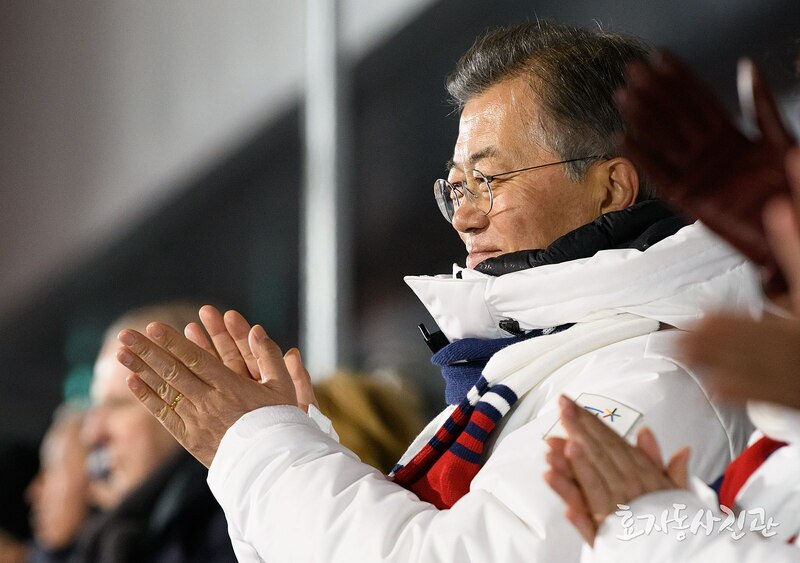 The 2018 PyeongChang Winter Olympics were more heavily politicized than most despite the fact that the Olympics are an inherent stage for soft power politics, along with a rule in the Olympic Charter against politicization. Some optimists dubbed the games as a potential “Peace Olympics”, a step to rapprochement, and a “diplomatic breakthrough” due to its potential to be a platform to soften tensions between North Korea and the United States after months of a nuclear standoff escalated by bombastic Twitter exchanges and American sanctions. Dialogue about a potential rapprochement between North Korea and South Korea has also fuelled much of the political discourse around the games. The Inter-Korean talks on January 9th, the first high level talks in 2 years, yielded a reinstatement of a military hotline between the two states and the decision to send a delegation of 22 North Korean athletes to the games. During the 1988 Summer Olympics in Seoul, North Korea bombed a Korean Air flight months prior to the games and refused to attend. In contrast, this year marked the first time that they would have a joint team. The team with 12 players from the North and 23 from the South created a lot of domestic backlash that was not as publicized by Western media. Reviewing the soft power politics that played out throughout the 2018 PyeongChang Winter Olympics, there is a stark difference between the way domestic and international audiences viewed the games. 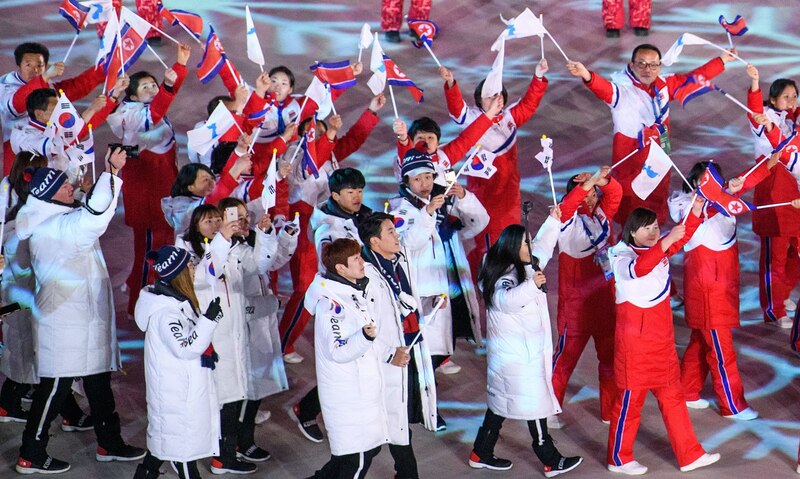 The opening ceremonies on February 9 saw North Korean and South Korean athletes marching into the stadium under a unified flag and with“Arirang”, a traditional folk song considered to be the unofficial national anthem of Greater Korea, playing in the background. Though this was not the first time the two nations have performed such a conciliatory gesture, this time around, it was highly symbolic and emotional given that the games were held on Korean soil. This historical moment quickly took over the front page of many news outlets due to the excitement it elicited. Unfortunately, this reporting neglected the other side of the story: the hundreds of protesters outside the PyeongChang Olympic stadium, hours before the opening ceremony. Also neglected from much of the international press’s coverage was an overnight sit-in at the border-crossing in an attempt to prevent General Kim Yong Chol, a North Korean official under U.S. sanctions from entering the country. General Kim is accused of orchestrating the sinking of the Cheonan naval corvette and the attack on Yeonpyeong Island in 2010. An estimated 800 people were at the sit-in and criticized South Korean President Moon Jae-in for utilizing the Olympics as a way to re-engage with the North. But that’s exactly what the Olympics was ideal for. The platform was one of soft power and geopolitically speaking, it was truly the right time and place. The diplomatic atmosphere was welcomed and bolstered by the United Nations as it lifted a travel ban on Choe Hwi, the chairman of the North Korean National Sports Guidance Committee, who was on the UN targeted sanctions blacklist so that talks could occur. These concessions made in order to promote dialogue between South Korea and North Korea were employed by President Moon for the sake of diplomatic expediency. Soft power politics at the Olympics has been greatly affected by the coverage of international media eager to see peace talks progress. Whilst there is room for optimism as a result of the pragmatism by both North and South Korea during the Olympics, marching under the same banner is not necessarily a prelude to unification. The reality is that conflating a united hockey team to an imminent unification is the kind of Western commentary that neglects the cultural and lived experiences of Koreans. While Western media exalt the idea of unification, they neglect the fact that an increasing number of South Koreans do not support it. Thomas Bach, the President of the International Olympic Committee, said that “The Olympic Games show us what the world could look like, if we were all guided by the Olympic spirit of respect and understanding.” However, we ought to address another branch of problematic discourse that has come from the glamourization and romanticization of a brutal regime. The way in which North Korean rhetoric has been presented and consumed by the Western press has led to the perception that Kim Jong-Un’s push for North Korean cooperation and presence at the Olympics is a “peace offensive”. It is in North Korea’s interests to play soft politics at the Olympics to improve its image and deflect attention away from its ominous track record: prison camps, starvation, and nuclear ambitions outside international regulatory measures. The term “charm offensive” was applied to the 230 cheerleaders from the “Army of Beauties” by the North Korean leader’s sister Kim Yo-Jong who was present at the opening and closing ceremonies. This so called charm offensive has also been bolstered through the orientalist lens that Westerners view North Korea. While North Korea utilized the Olympics to soften increasing international hostility, President Moon Jae-In’s agenda is to bolster stronger relations with North Korea which directly complicates its relationship with the United States. The Inter-Korean talks that Moon Jae-in has orchestrated carry a hope that they will translate into talks between the US and North Korea. The promotion of a stronger inter-Korean relationship, is reflective of Kim Dae-jung’s Sunshine Policy that Moon promised in his platform and has been moved by South Korean Unification Minister Cho Myoung-Gyon. However, it has led to much criticism. Gallup Korea’s latest poll of 1,005 adults ranks Moon’s current approval rating at 67% overall. In an interview with Monocle, Moon reaffirms that his “goal is to resolve the North Korean nuclear issue and solidify peace” while in office, stopping short of unification. After the Olympics, his focus will return to domestic issues as his one year anniversary in office approaches. His campaign promise to enact constitutional reform to clean up corruption will be tangible come June when there is a referendum on constitutional reform, which would be the first constitutional amendment since the democratic transition in 1987. The reform focuses on limiting executive power, giving greater jurisdiction to local governments. Now that the Olympics are over, Moon’s approval ratings have rebounded and his efforts have resulted in success and as of March 9th Trump has accepted a personal invitation to meet with Kim Jong-Un which has been a part of Moon’s goal all along. South Korea’s national security chief Chung Eui-yong stated that North Korea is ”committed to denuclearization” and while North Korea has a history of reneging on its commitments, it is still a great achievement praised by many as a diplomatic win. The diplomatic setting created by Moon has made him stand out, especially in light of America’s soft power recession. His commitment to building a stronger relationship with North Korea while maintaining policy cohesion with the United States is not an easy one. While the Trump administration has continued peddling talk of wider and deeper sanctions in the midst of the Games, President Moon has been able to take the driver’s seat in diplomatically engaging with North Korea. The South Korean head-of-state has planned an Inter-Korean summit next month that will be held in the demilitarised zone (DMZ). 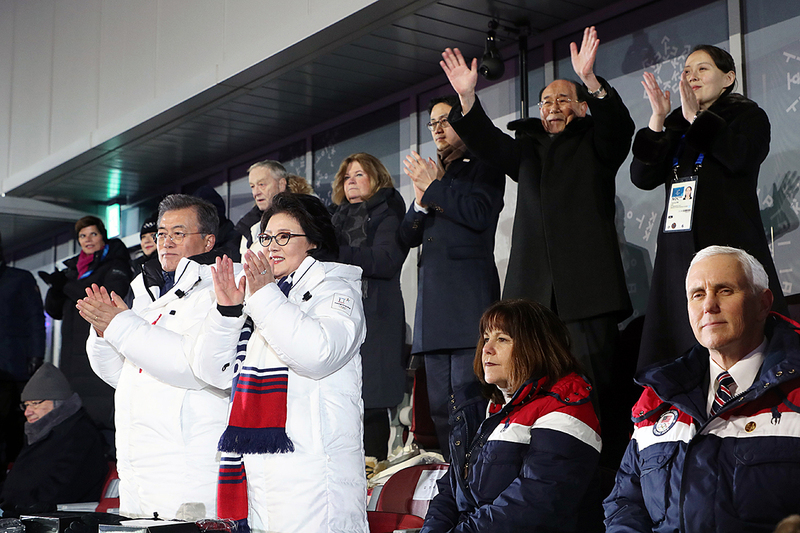 Chan Ung, the sole representative of North Korea to the IOC stated that “Sport exchanges can only continue to grow when political circumstances improve,” and PyeongChang has shown how the games can also help improve political circumstances. Indeed, it is a game that President Moon has come out of as a soft power winner.